We are running a free workshop in London on October 23 as part of our exploration into how people can use digital technologies to prepare for and enjoy later life – and we are releasing another bunch of tickets today. You can see from our previous workshop with Nominet Trust, on young people and digital tech, that it is likely to be a lively affair. We’ve already recruited some key researchers and specialists in the field, and hope we’ll also attract people working day-to-day on how to help older people explore the benefits of digital tech. Or just using it themselves. Computers, tablets, phones, cameras, and other devices and apps will figure … though exploration so far suggests it is people’s attitudes to new opportunities that are important as the digital offerings. We want stories more than specs. The event is on the morning of the 23rd at the RSA in London, and you can sign up here. We are also running an online space, where we hope you will join us whether or not you can make it to the workshop. If we are oversubscribed, preference will be given to those who have contributed there and/or on our open Google doc … so ideas please! Once we have some more contributions (links summarised below), I’ll have a go at mapping the ideas and messages emerging on our doc, as I did with some Our Society ideas here. That should provide us with a backcloth to generate more for discussion at the workshop. I’ll also be working through with my colleague Drew Mackie, and the Nominet Trust team, how we can best bring general principles into sharper focus by talking about people, technology and different life situations. We may be inventing some not-so-fictional characters, facing new life challenges and opportunities. 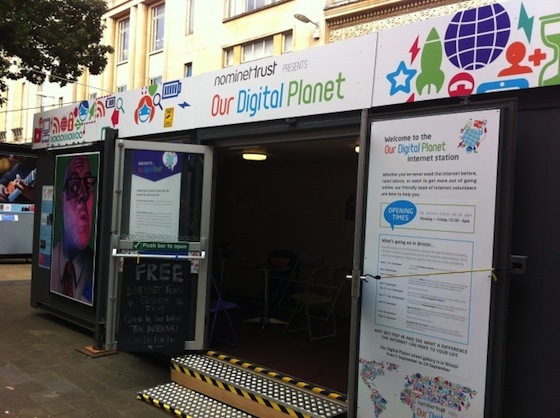 On the 23rd John Popham is going to be in Liverpool with Nominet Trust’s Our Digital Planet project where he will be continuing the on-the-ground exploration of the positive impact of the Internet on our lives which started in a touring exhibition here. Can we do a video hookup with a group at the exhibition? If anyone can, John can. More later on that. In summary, by the end of November 2012 we aim to have a provocations paper with some key messages, background resources, and a network of people who may wish to continue exploring. Here’s how you can join in. Follow posts on this site: email subscription, and category feed on the right. Contribute to our open Google doc and help develop some key messages. More here about the socialreporters team, including contact details, and about the earlier Digital Edge exploration here.